Nah, not really. I’m just funnin’. But I started this review that way because the way that people talk about such reality shows such as the various “Real Housewives” or “Survivor” “American Idol” ”Jersey Shore” or “Basketball Wives” ruining television today is the same way they talked about “The Gong Show” back in the 1970’s. Produced and hosted by Chuck Barris who already had a couple of game show hits with “The Newlywed Game” and “The Dating Game.” “The Gong Show” was a talent show with amateur contestants performing in front of three celebrity judges. If an act was really bad (and most of ‘em were) any one of the judges could hit a large gong with an equally large mallet. Some of the acts were so bad that the celebrity judges would bang the gong together or even comically struggle with each other for the honor of gonging the act. But if an act did manage to win, they were awarded the princely sum of $516.32. As the host, Chuck Barris originally was very nervous and it showed. But he quickly loosened up, wearing silly hats, clothes that looked as if he’d gotten them from the Salvation Army, using eccentric props and generally acting so goofy and off-the-wall that a lot of people watching at home thought Barris actually was drunk on stage. But he was the perfect ringmaster for this insane circus that everybody participated in. The studio audience was always loud and raucous and the celebrity guests threw all caution to the wind. There were a whole bunch of celebrity judges, some very well known such as Bill Bixby, Dr. Joyce Brothers, Richard Dawson, David Letterman, Joan Rivers and Suzanne Somers. Others were staples of the daytime TV game show circuit who made a pretty good living just appearing on game shows. But the celebrity hosts that were the most popular were Jamie Farr, Arte Johnson and Jaye P. Morgan who was without a doubt the most risqué. Her one-liners frequently had to be bleeped and she seemed incapable of speaking in anything but but sexual double-entendres. I realize this review is going into far more background than most of my reviews but I fairly comfortable in saying that most of you reading this have probably never heard of “The Gong Show” let alone seen an episode so I felt a little history was needed for you to understand why I was so delighted when during a free weekend of HBO I was able to see THE GONG SHOW MOVIE, a movie I haven’t seen in I don’t know how many years since it’s one of those movies that has never been available on VHS or DVD so the only way to see it is if you subscribe to one of those premium movie channels. 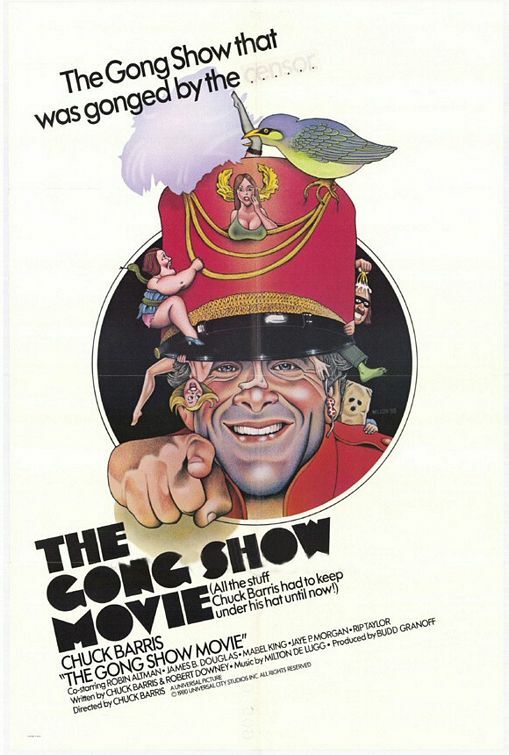 THE GONG SHOW MOVIE is a fictionalized week in the life of Chuck Barris as he struggles to balance leading a quiet life with his wife Red (Robin Altman, his real life wife at the time) with the zaniness of being the producer/host of the most popular show on daytime television. It isn’t easy because everywhere he goes he’s recognized as “Chuckie Baby” and everybody wants to audition for him. No matter what he’s doing and where he is. His loyal secretary Mabel (Mabel King) begs him to get some proper rest. The network executive Buddy Didlo (James B. Douglas) begs him to please tone down the vulgar wildness and out-of-hand risqué humor. The movie has some of the wacky and downright perverse brilliance that made the show so enjoyable. The movie has many scenes from the TV show intercut, including Chuck in auditions and acts that that were no doubt considered just too much for daytime. The movie also has that breast baring incident, thank you Miss Jaye P. Morgan. The acting is nothing to brag about but for me that just adds to the anarchistic spirit of “The Gong Show.” In this period we live in now, where the Cult of Celebrity is at its height, it’s refreshing to see a bunch of people who just want to have fun with whatever mediocre talent they have and look for no more than to make people laugh. I’ll take “The Gong Show” contestants over today’s crop of wanna-be’s who believe they should be famous just because they want to be famous. So should you see THE GONG SHOW MOVIE? As I said, unless you subscribe to HBO or Showtime or some other premier movie channel then it’s highly unlikely you’ll get a chance to. And the movie would probably be only of interest to folks like me who remember the TV show. I really hope it makes it way to DVD because it would make a perfect double-feature with the Chuck Barris biopic “Confessions Of A Dangerous Mind” But if you do get a chance to see it, give it a try. For me it’s a wonderful bit of nostalgia to indulge in. THE GONG SHOW MOVIE is cheerful and anarchistic fun that wants to do nothing more than make you part of its kooky absurdity and that’s enough for me. I now regret giving away my DVD recorder a few years back. But once I got Netflix and with so many ways to watch a movie now, I didn’t figure I needed it. But I do for the few movies such as THE GONG SHOW MOVIE that are not available on DVD.